For a long time, I didn’t enjoy this Godzilla film, “The Return of Godzilla.” This was mostly because my only experience with the film was the American version that drastically changed the intent and message of the original Japanese version. The American film, “Godzilla 1985” was made by New World Cinema, owned by controversial B-movie filmmaker Roger Corman. But the reason Corman turned out a sorry product with “Godzilla 1985” was because you had a B-movie director trying to handle a monster movie that is deadly serious. It wasn’t until I watched the Japanese version recently that I understood why this is regarded as one of the best Godzilla films. “The Return of Godzilla” is the spiritual successor to the original 1954 “Godzilla” in more ways than one. It not only ignores every Godzilla film that happened between 1955 and 1975, but it updates the original’s message on nuclear weapons and progression of science for a modern age by setting it in the midst of the Cold War. Honestly, Japan has one of the most unique perspectives on the Cold War, even if they weren’t involved. They sit right in the middle of two countries that were one bad argument away from nuclear war that could annihilate the world. If any country was going to get caught in the crossfire between the United States and the Soviet Union’s ego battle, it was going to be Japan. Not only that, but Japan had evolved a lot since the last Godzilla film in 1975, becoming a economic and technological powerhouse, but still with visible wounds from World War II. So it made sense to bring Godzilla back to make a new statement about the world and its use of nuclear weapons. Keep in mind that in the three Godzilla movies prior to this one, we had a robot that looked like Jack Nicholson that could change his own size despite his creator not programming that in him, an underground civilization that had its own giant monster that looked like a cockroach, a princess singing to a giant golem/dog monster to wake it up to fight a giant robot, and Godzilla taking on the power of electricity to turn himself into a magnet. 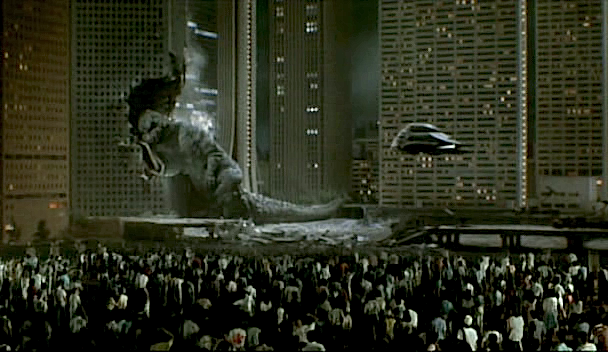 It’s safe to say that the Godzilla series had stopped taking itself seriously and wanted to tell a story that harkened back to the first Godzilla film, the one that dared to show a whole hospital full of people that had been affected by Godzilla’s rampage. There’s not much to say about the plot, especially since the title is the most accurate descriptor – Godzilla returns. The film is set in 1984, during the height of the Cold War, when a massive shift in the tectonic plates causes Godzilla to erupt out of the Earth and to reek havoc on Japan once again. Of course, we only catch a brief glimpse of Godzilla in the first 45 minutes, so the first half of the film follows the implication that Godzilla is back once again. The Japanese government doesn’t respond well to the news that a giant monster is coming to destroy everything again, so they don’t do anything about it until they feel like there’s enough evidence to suggest Godzilla is on the move. This results in a Russian nuclear submarine being attacked and destroyed by Godzilla, with the Soviets immediately blaming the Americans for destroying the sub and the Japanese for letting this happen in their waters. 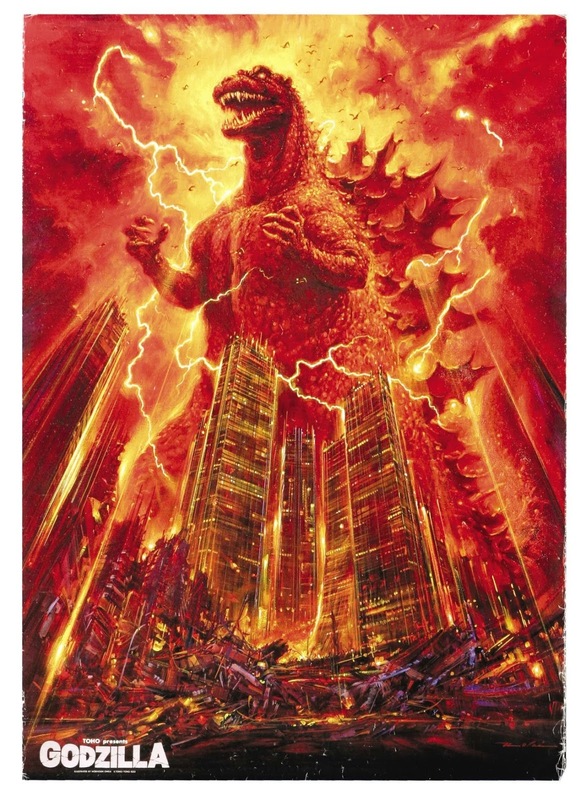 Once the prime minister gets confirmation that it was Godzilla that destroyed the sub, it puts all of Japan in a difficult and almost hilarious spot – The prime minister has to stand in front of the entire world and tell everyone it wasn’t the Americans that attacked the Soviets, it was Godzilla! So not only have you made things politically difficult between two warring nations, but you just confirmed that a giant fire-breathing indestructible monster could strike anywhere in the world at any time. This sparks a long debate between representatives of Japan, America, and the Soviet Union, with the two former nations both pushing their own nuclear agendas on Japan. The Soviets say their in more danger, since Godzilla is much closer to Russia than America, and that they should be the one to take care of the monster. But the Americans and Japanese are now allies, so they think they should destroy Godzilla. This is what I mean by the Japanese being a difficult spot with the Cold War – stuck right in the middle of two powerful nations who want to use Japan for their own needs. This is a country that’s already seen the horrors of nuclear weapons first hand, and they know they don’t want to go through it again. In the end, the film’s decision on this is to show the resolve and determination of the Japanese people by saying they will not be bullied or threatened by anything that either side wants to force on them. The prime minister’s ultimate choice is that nobody will use any nuclear weapons on Godzilla, even if he reaches the Japanese mainland. Instead, the Japanese government starts searching for other alternatives to stop Godzilla aside from dropping a giant death bomb on him. The defense forces’ top weapon is the Super-X, a flying fortress that could withstand Godzilla’s atomic breath and comes equipped with cadmium missiles that would infect Godzilla with a poison that will slow down his heart. The prime minister gives his approval and the defense force is up on alert. Additionally, the government hires scientists to research everything they have on Godzilla to try and find an exploitable weakness. This is where our main cast of characters come into play, including reporter Goro Maki (Ken Tanaka), sailor Naoko Okumura (Yasuko Sawaguchi) who witnessed Godzilla erupt from the Earth at the beginning of the movie, and professor Makoto Hayashida (Yosuke Natsuki). Hayashida lost his parents in Godzilla’s initial attack in 1954 and describes Godzilla as a living nuclear weapon – he can’t be reasoned with, can’t be out ran or over powered, nor does he care about the lives he is trampling or setting ablaze. He is without mercy, compassion, or fear, only the desire to destroy. We get our first glimpse of Godzilla about halfway through the film when he attacks a nuclear power plant in Ihama, and it is a haunting yet forceful introduction. 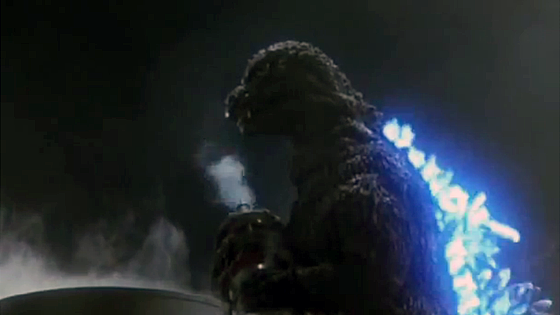 The first few shots are from Godzilla’s point of view as he breaks through a bank of fog to approach the power plant. Then there’s a shot from a soldier’s perspective, starting at Godzilla’s toes and working up the entire length of his body to show how imposing he truly is. Outside of the newest Godzilla films, “The Return of Godzilla” is the best film to put Godzilla’s size and scale to good use, especially with so many shots from human perspectives as Godzilla is about to trample on them. I’ve always had mixed reactions to the Godzilla suit in this film. Sometimes the suit looks terrifying, especially from lower angels and shots that focus on his gigantic mouth. 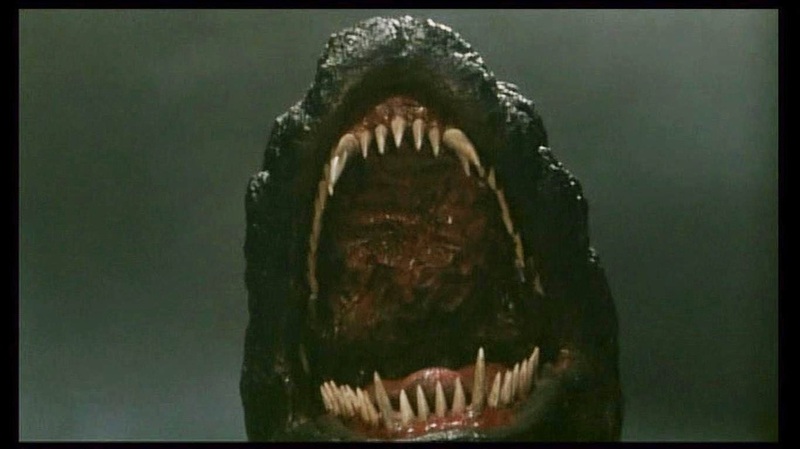 His teeth and massive maw might be the scariest part, because any time there’s a shot of Godzilla reeling back to roar, the dread and hopelessness of fighting him sinks in even deeper. The problem I have with this Godzilla suit is how inconsistent it feels. Sometimes the animatronics on the head and mouth are great and sometimes they look silly. There are several shots of Godzilla with the most derpy and lifeless expression on his face, like he has a thousand-yard stare. 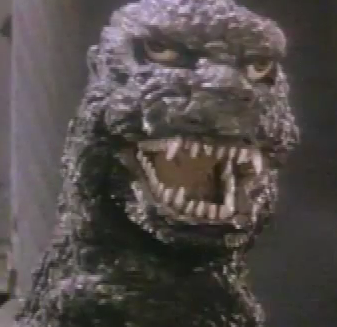 There’s also points where Godzilla has an insanely tiny neck, like his head has inflated like a balloon. I wouldn’t have a problem with any of this if it was constantly like that, but it keeps changing depending on the animatronics they used. This film may have some of the best special effects of any Godzilla film, but the animatronics weren’t as good as they could have been. Anyway, during Godzilla’s attack on the power plant, the scientists are confused when Godzilla stops his attack just to follow a flock of birds. Professor Hayashida proposes that Godzilla was distracted instinctively by a homing signal caused by these birds, since he is related to them in some way. The scientists find their weakness to exploit and come up with a plan to plant a similar homing signal at a nearby volcano, lure Godzilla to the mouth of the volcano, start a contained volcanic explosion and capture Godzilla inside of it. Unbeknownst to all of these plans by the Japanese government, the Soviets have gone against the words of the prime minister and have one of their ships disguised as a freighter in Tokyo Harbor that is prepared to launch a nuclear missile from their orbiting satellites. Should Godzilla attack Japan, an automatic countdown for the missile launch will begin. As this dire news comes to life, Godzilla rises out of Tokyo Bay and makes his way towards the most populated city in the world. The defense force does their best to fight off Godzilla, but they’re about as successful as using a squirt gun to stop a shark. 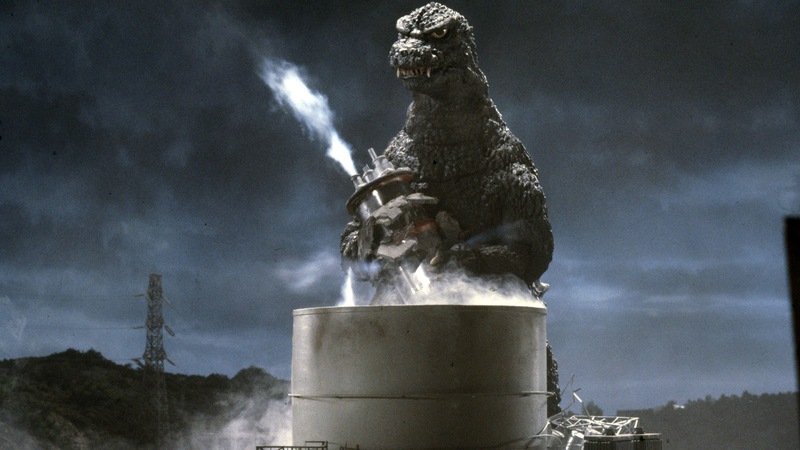 Godzilla not only blows up every jet but reduces nearly every ground troop to ash with one blast of his atomic breath. When I was a kid, the special effects for “The Return of Godzilla” always looked weird to me. I would say this is because they looked so different from the effects of the Showa series. The thought that special effects would get better over time never crossed my mind. Not only are the effects in this film more lively and realistic than the Showa series, but they’re even better than most of the effects in the later Heisei series. 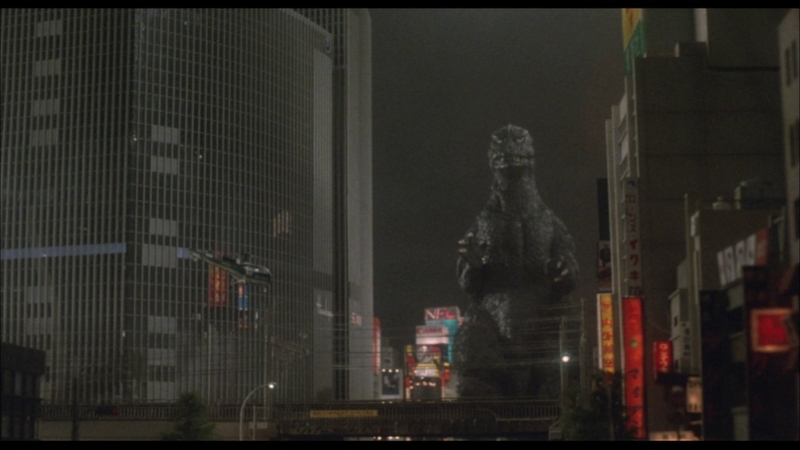 Consider the start of Godzilla’s initial attack on Tokyo here, where we see an lively and brightly colored Tokyo landscape, filled with neon signs, buildings taller than Godzilla and a modern train track. 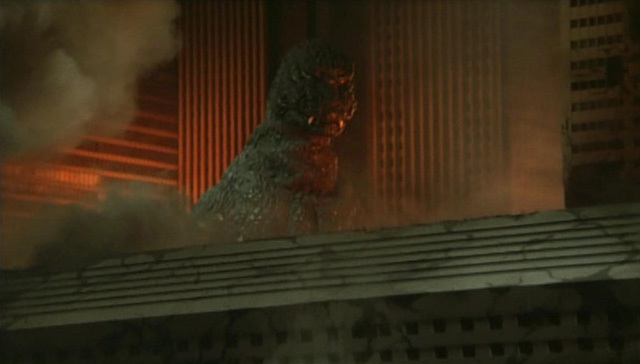 One of the first shots is the side of a building that shows Godzilla’s reflection before we even see the rest of him, followed Godzilla accidently stepping in hole that leads underground to the subway and his claw scrapping the side of that same building, sending glass and metal beams every direction. This is followed by Godzilla dislodging a train from the tracks and lifting up one of the cars to roar at it, to bad for the owners of these car if they didn’t have van insurance. This film takes advantage of its landscape and Godzilla’s size every opportunity it gets to make a rampage that is almost as terrifying as his original attack on Tokyo in 1954. Almost. Anyway, the freighter that holds the missile countdown is attacked and damaged by Godzilla and the timer starts. The captain tries to stop the countdown before it’s too late, but is killed due to his injuries before he can do so, and the nuclear missile is launched right at the heart of Tokyo. While this is going on, the Super-X is launched to combat Godzilla, which tanks Godzilla’s atomic breath and fires enough cadmium shells to slow down his heart and knock him unconscious. This victory is brief though, since the Japanese immediately get word that the Soviets launched the nuke at Godzilla and they can’t stop it. The prime minister begs the Americans to fire a counter-missile at the nuke before it’s too late and they do so, leading to the suspenseful scene that you’ll find in any Cold War film involving nuclear weapons. However, where this film differs is that the two missiles collide in the stratosphere just above downtown Tokyo. While the nuclear blast was averted, it does light up the surrounding atmosphere, providing a bright orange and red light show that leads to an electrical storm and an EMP that shuts down everything electrical in Tokyo, including the Super-X. But some things involving Godzilla never die and every blast of electricity from the storm is drawn to him. With all that extra power, Godzilla awakens again and heads straight for the downed Super-X. This leads to my favorite part of the movie as Godzilla and the Super-X had an all-out fight through Tokyo, putting all the special effects to use. Even though the Super-X pilots forget about the cadmium shells, they put up a great fight as they get continually blasted by Godzilla and even fight through the giant holes Godzilla puts in the sides of buildings. I love the shot of the Super-X firing everything through this giant hole in a skyscraper while Godzilla just walks right at the machine, even with the building in the way. The fight ends with most of downtown Tokyo being set ablaze and Godzilla knocking over a building three times his size on top of the Super-X. This leads to some great cinematography as Godzilla’s size not only comes back into play, but makes great use of the burning city. Just as Godzilla is about to crush Goro Maki, Professor Hayashida finally finishes setting everything up at the closest active volcano to Tokyo, Mt. Mihara. He turns on the machine and it immediately gets Godzilla’s attention, who stops his rampage on Tokyo to head to the volcano. Once he’s there, suddenly the shot of Godzilla’s thousand-yard stare works when he sees the machine sending out the homing signal, realizing it’s too late for him to leave and is dropped into the mouth of the volcano. The final scene of Godzilla being forced inside of Mt. Mihara has always been a weird one to me. The music is immensely sad and a little heart-breaking, as if this is a terrible thing we’re doing or that we’re supposed to feel sorry for Godzilla. While the scene does have breath-taking cinematography, especially in the final shot of Godzilla falling inside the volcano, I never felt bad that this had to happen to him. Godzilla is the true villain of this movie and now the rest of the world is safe from his destruction. Still, the ending is just as satisfying as the rest of the movie so I can’t complain too much. I should mention that, like “King Kong vs. Godzilla,” the American version of this movie is different. Roger Corman wanted to make a film that didn’t feel like an American-version of a Japanese film, but to make a sequel to another film, “Godzilla, King of the Monsters!” That film was the American-version of the first Godzilla movie, which took out 10 minutes of original Japanese footage and added 20 minutes of new footage, mostly scenes with American actor Raymond Burr playing a reporter who witnesses Godzilla’s attack on Japan firsthand. While that movie is fine, it does strip away most of the nuclear weapon subtext and complexity of the Japanese film and simplifies most of story. Likewise, “Godzilla 1985” takes out most of the subtext involving the Cold War and simplifies everything down to just an average monster movie. The American version brought back Raymond Burr to play the same character he did in “Godzilla, King of the Monsters!” though changed his name slightly. His character’s name was Steve Martin, which wasn’t a problem in 1956, but in 1985, comedian Steve Martin was popular. They didn’t want to confuse people so they just referred to Burr as Mr. Martin, as he is now a consultant for the Americans who are witnessing Godzilla’s attack on Tokyo. One controversial change “Godzilla 1985” made was during the scene on the Soviet freighter after the countdown has started. In the American version, the captain deliberately launches the missile instead of attempting to stop the missile. “Godzilla 1985” is a dumb movie that lacks complexities or understanding of the source material and would rather promote products like Dr. Pepper instead of tell a good story. “The Return of Godzilla,” on the other hand, is a worthy successor to the original “Godzilla.” It is moody, atmospheric, and downright chilling at times, especially in the details with Godzilla’s attack. It makes a modern statement on nuclear weapons and the Cold War without diluting it for the sake of drama or action. The special effects, while looking a little dated at times, still hold up today and look different from any other Godzilla movie. As the start to the Heisei series, you couldn’t have asked for something better than this.